So, let’s dive in. Thursday consisted of several games in northeast Ohio. A result of a teachers’ conference that leads to many schools not having Friday classes. And many of those to play on Thursday night instead. One such game is between Liberty and Jefferson. The fourth straight year the two All-American Conference opponents have squared off on a Thursday night. Elsewhere in the valley, Howland was hosting Niles McKinley. The game wasn’t expecting a huge crowd. Thursday, cold, and an 0-7 Jefferson Falcons team weren’t exactly going to be big draws. The Liberty Leopards lept out to a 20-0 first quarter lead, and doubled it at the half. With a running clock for the entire second half, the second half was brisk and mostly uneventful. One more touchdown for Liberty in the third finished out the scoring. Friday night was a few options and none really intriguing. I wanted to travel down to Charleroi for their matchup with McGuffey. A game, in retrospect, would’ve probably been one of the best of the night. But, the late start from home meant showing up just at kickoff. Something I didn’t want to plan on with a two-plus hour drive. So, I went with my backup option: Avonworth hosting East Allegheny. A decent matchup between the 6-1 Avonworth Antelopes and 5-2 East Allegheny Wild Cats. East Allegheny is self-explanatory. Avonworth is an amalgamation of Ben Avon Heights and Emsworth. The two main communities the district covers. Along with Ohio Twp. Avonworth opened the game quickly with a 92-yard kickoff return for a TD. The game started rather competitive, but the first quarter gave way to Avonworth having their way. East Allegheny made it interesting with a 99-yard interception return for a touchdown. But, that’s all she wrote. Avonworth helped solidify their playoff credentials, going to 7-1 on the season. Saturday, then, was a long planned trip to New York. Section 6 covers the far western part of the state. And in the far southwest corner of the state, just north of Corry and Youngsville, mostly, are three small schools: Clymer, Sherman, and Panama. Clymer being just a few miles north of the border from Corry. A school you most definitely don’t hear about in PA. There’s very little overlap. Sometimes, Olean plays Bradford. Or a Buffalo private will play Cathedral Prep. But, rarely, do you see any other crossovers. So, keeping tabs on the Empire State isn’t exactly common. Clymer and Sherman, which is located just off I-86, have had a co-op for several years. If you’ve visited either of these two towns, you’d understand why. And just recently, Panama had joined the co-op. Once, three rivals are now one team. The CSP Wolfpack, as they’re known. Clymer/Sherman/Panama. They’re in New York’s smallest classification, Class D, and are currently the #1 team in the state, and undefeated. The team shares time at all three schools. Alternating games and practices among the three. Panama, with arguably the largest stadium, hosts two of the eight games this year. While Clymer and Sherman host one game each. Jack Keeney Community Field is a small venue situated on a hill behind Panama Central School. It’s included with stepped hills to the north, where many fans just stood to watch the game. Which helps considering just how small the visitor side is. The home side has one small stand separated from the main stand and press box. A small concession stand is located near the west endzone along the sideline. There is a track. And it’s all grass. And with the heavy rain before the game, turned it to a slippy, muddy mess. Class D has only four teams in Section 6. A result of two co-ops. 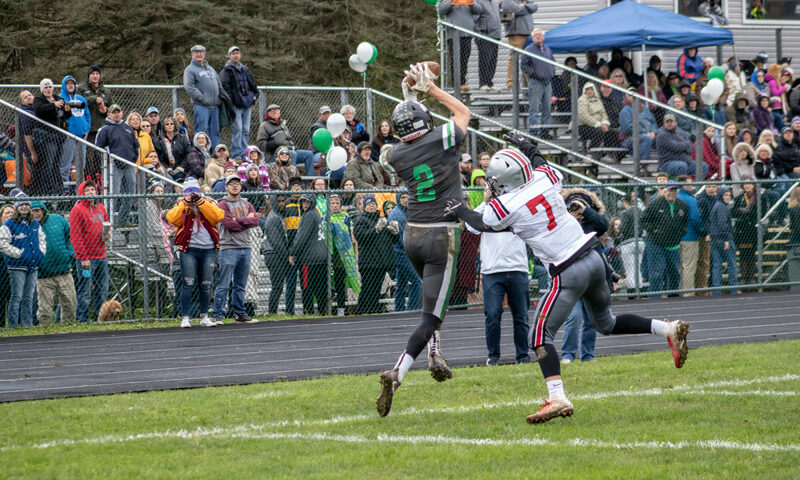 Chautauqua Lake’s co-op with Westfield pushed them to Class C, while Randolph’s co-op with Frewsburg moved them up, as well. That left only CSP, Maple Grove, Cattaragus-Little Valley and Salamanca. The section setup the 2018 season with a double-round-robin setup. An eight-game schedule since an additional round of the playoffs was unnecessary. This was the second matchup of the season between Salamanca and CSP. The first game postponed due to tornado warnings in the area. The same weekend many PIAA District 10 games were moved up or postponed to Saturday. Their game in Salamanca was moved to Saturday morning to be finished. Despite being heavy underdogs, the Salamanca Indians held the vaunted Wolfpack scoreless in the first quarter. But, then the floodgates opened. CSP scored three touchdowns, including two in the waning moments of the half, to demoralize the visitors. The third quarter was more of the same, as they tacked on three more touchdowns to post an even 40 on the board. An uneventful, and cold, fourth quarter went without issue. A cycling of backups and little used players to finish out the game. 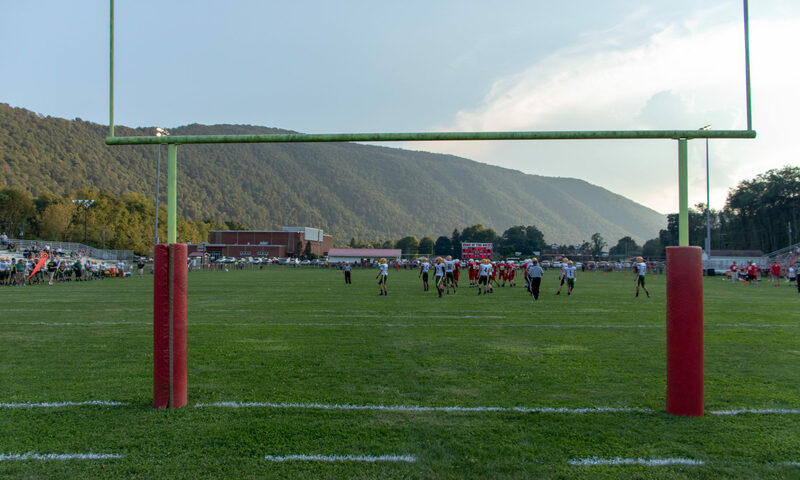 After seeing the remaining two teams of Section 6, Class D on the season, it was on to Duke Center, PA for an odd Saturday night matchup between the homestanding Otto-Eldred Terrors and the visiting Curwensville Golden Tide. The visitors were overwhelming favorites, and showed it with a quick 12-0 first quarter lead. The Terrors made it interesting, though, with a touchdown that kept the score a respectable, 21-8, at the break. The second half became quite scrappy and Otto-Eldred’s resolve diminished as Curwensville piled up the points. Finally winning, 48-14 in a game that, despite going to the favorites, felt much closer than the final score indicated. After the 6:30pm start went until nearly 9:30pm, it was a 3-plus hour drive home. And an early outing Sunday for the Browns-Chargers game in Cleveland. Hence the delay here. More photos from Week 8 can be found HERE.